Question:The toilet in my forest river wildcat will not stop running. The foot level is in the off position but water still running. How do I correct this? Robbie: Without knowing the model of your toilet its hard to pinpoint your problem but most of the time with a problem like you have its the flush valve or the ball valve. If the Ball valve sticks it will hold the flush valve open try allowing the ball valve to snap closed a few times if that doesn't work you can remove the toilet and take it into a repair center to have it fixed. Some models are cheaper to replace than to repair. Join in and write your own page! It's easy to do. How? Simply click here to return to RV Questions and Answers. We pride ourselves on being able to offer free, quality information to RVers about repair and service. If advice on this site has saved you money or time, we would certainly appreciate it if you would consider making a small donation. All proceeds go towards supporting our continued effort to provide you with quality, money-saving RV repair info. Looking for some more great money saving strategies? I promise to use it only to send you the Money Saving RV Newsletter. Hi, I'm Robbie. Welcome to Money-Saving-RV-Repair.com! Like the name implies, this site is all about helping you save money while keeping your RV in tip-top shape--and that is all about you having the knowledge to do so. 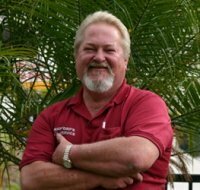 I've been a technician in the RV industry for 30 years, operating out of San Diego, California. And let me tell you, I love my job. But I also love empowering RVers with the knowledge they need to make the right decision on repairs, or to make the fix themselves--and that, my friend, is the reason for this website. I hope you enjoy. Or, learn more about me, my RV service practice, & this website here. Copyright © 2010 - 2017 Money-Saving-RV-Repair.com. All Rights Reserved.